Product #3179 | SKU beDI800V2 | 0.0 (no ratings yet) Thanks for your rating! 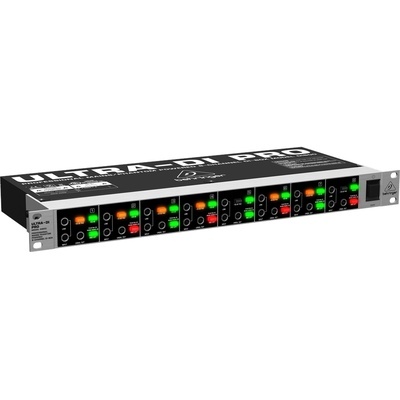 The ULTRA-DI PRO DI800 V2 is a professional mains/phantom powered 8-channel active DI-box. If you need a rack-mountable DI unit with enough inputs to accommodate everyone on stage or in the studio, plug into the DI800. Direct Injection (DI) boxes make it possible to connect guitars, basses and keyboards (as well as other line-level devices) to audio mixers and recorders. They are absolutely essential for proper impedance matching and to maintain signal integrity. BEHRINGER active DIs feature “buffered” inputs that won’t degrade the source signal like passive DI boxes can. Balanced signals leaving the DI800 are extremely low impedance (typically less than 680 O), and far less susceptible to noise and interference. 1/4" In, XLR Out—Is That All? When it comes right down to it, all DI boxes do the same thing, right? Yes, but the DI800 does much more than just “bass guitar in, mic level signal out.” It really is a highly versatile input-signal toolkit. Maybe you’d like to connect your guitar amp’s speaker output to your mixer? Not a problem, the DI800 features a -30 dB attenuation switch, allowing you to connect to speaker outputs (up to 3,000 Watts!) and convert them to balanced XLR outs. Got a weak incoming signal? The DI800 has a +20 dB switch, which really comes in handy for boosting low-level input signals. Of course, the DI800 V2 provides a LINK output for easy connection to other equipment, such as onstage amplifiers and monitor consoles. Servo-balanced performance guarantees ultra-flat frequency response, and the gold-plated XLR output connectors provide reliable, low-noise operation. Per channel ground lift switches eliminate ground-loop hum problems. The DI800 does everything a standalone DI can do—times eight! Unlike their passive counterparts, active DI boxes require a power source to make their internal electronics work. The DI800 provides two power options: 120 – 240 V~ from the nearest wall outlet or power strip, or +18 to +48 V DC from your mixer’s phantom power supply.